I am currently reading two books that while they aren’t about small churches or about churches of any size, they are stretching my thinking and challenging my walk with God. 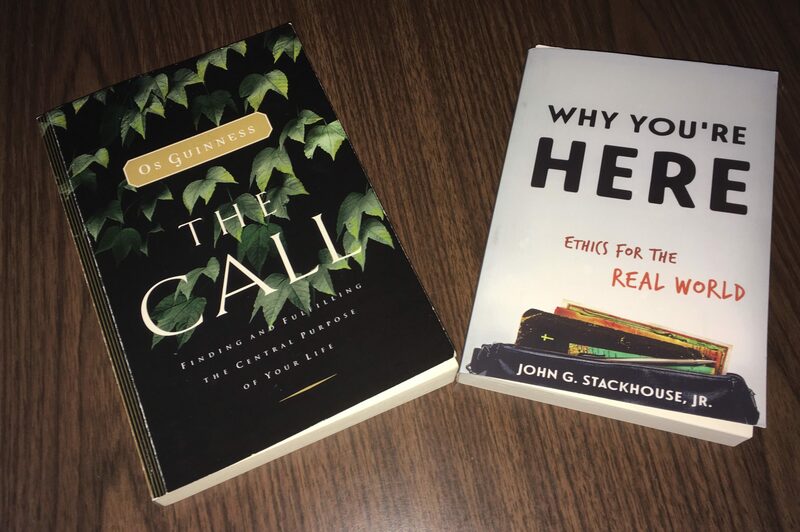 The first is a new publication written by John Stackhouse, Jr. entitled Why You’re Here: Ethics for the Real World. I enjoy anything written by Stackhouse and this book hasn’t disappointed. I’m only a few chapters into the book so I can’t offer an informed evaluation but so far it has been excellent. It has a 2018 copyright so it is hot off the press. The second book is a little older with a 1998, 2003 copyright but still well worth the read. The title of the book is The Call: Finding and Fulfilling The Central Purpose of Your Life. It is written by Os Guinness who along with his excellent work as a Christian commentator is the great, great, great grandson of Arthur Guinness the Irish brewer. This book was recommended to me and I am grateful to the person who suggested that I read it. Every church leader should be a reader, whatever form that might take – books, journals, blogs. I know that some of you probably prefer listening to podcasts but there is still a lot of value in the written form. I don’t respond to most blogs that I read. I hate taking the extra time that a reply requires and even though I know how much your replies mean to me, I still don’t tend to reply to others. I am going to ask you though to take a few minutes to reply to this entry. I love it when a book or article helps shape my thinking. I love it when something gives me cause to question my perspective on life. I have learned some things over the years but I still have a lot to learn. Both of the books that I mentioned above have forced me to rethink things and I am richer for it. I am constantly looking for things that will challenge my understanding of the church and particularly the small church. Having served for about forty years in some form of ministry I have realized more and more each year how much more I have to learn. I would like you to help me in this learning process. I would like to publish a list of resources that have helped shape your understanding of the church. It may be a book or an article, it may be a podcast or a blog. It may be a sermon that you heard. What has challenged your understanding of your church? What has helped make it into what it is today? Please take a couple of minutes and share with me what that resource is. I will then in turn share with you what others have recommended. I won’t pass judgment on what you send. I will simply pass the titles on to others and let them decide how helpful it is. When I was a child, I used to go raspberry picking with my Aunt. She lived about a half mile down the road from where I lived and I would walk to her place and then pile into the little trailer that was hooked up to the tractor and drive the two or three miles to the berry patch. We were given strict instructions not to share the location of the patch with any of our neighbours. My mom made it clear that there were only enough berries for our two families. I had seven siblings so it took a lot of berries just for our family alone. As far as I know no one else ever visited the berry patch but us. Some things are best kept to oneself but most things are meant to share. Helpful resources are one of those things. If a book or other resource impacts our lives in a positive way we should spread the news around so other people have the chance to benefit. Thank you for taking a few minutes to help other readers be blessed.